Both Pohlkamp brothers skate to their bench during a stoppage Saturday against Alabama-Huntsville. (Photo by Jessi Renner/BGSUHockey.com). Matt Pohlkamp and Chris Pohlkamp have always been close. The brothers are the oldest of Joe and Mary Pohlkamp’s six children. Now, they’re finishing their second and final season of being teammates on the Bowling Green Falcon hockey team. Matt is a senior forward, who turns 24-years-old in June. Chris, a sophomore defenseman, will be 22 in July. 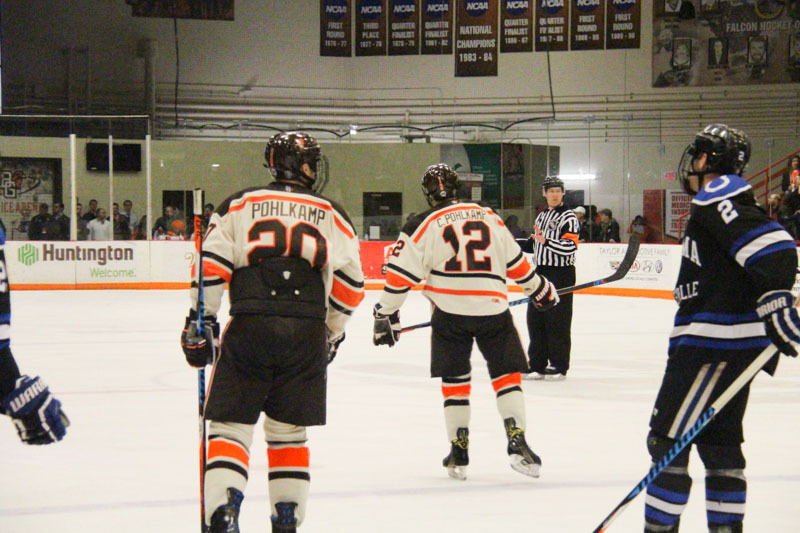 The Pohlkamps will be back on the ice this weekend when they host Ferris State in the quarterfinals of the Western Collegiate Hockey Association Playoffs. 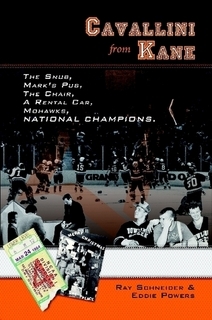 The best-of-3 series is Friday, Saturday and, if necessary, Sunday at 7:07 p.m. 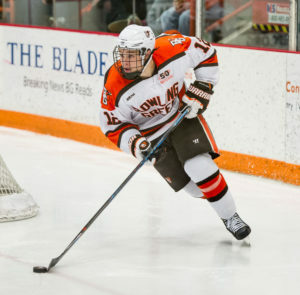 Bowling Green’s Chris Pohlkamp controls the puck against Alabama-Huntsville during his team’s 7-0 win Friday. (Photos by Todd Pavlack/BGSUHockey.com). Because of the Pohlkamps’ age difference, they were never hockey teammates until Matt’s junior and senior seasons at Brainerd High School in north central Minnesota. They were Brainerd teammates during the 2010-11 and 2011-12 seasons. The two then became teammates again with the Falcons last season. Brainerd is just over two hours north of the Minneapolis-St. Paul area. The Pohlkamps live in Baxter, Minnesota, just four miles west of Brainerd. “It’s made it a lot more fun, having my brother on the team,” Matt said. Matt’s and Chris’ home on the lake was the center of activity for them and their friends. The Pohlkamps either would walk or bike to the local park for house and travel baseball games and practices when they were growing up. Immediately following those baseball games, Matt, Chris and their friends often returned to the Pohlkamps for swimming and boating on the lake or pickup football games. The brothers laughed when recalling their childhoods, including the memory of their sharing bunk beds when they were young. They even claimed they ran the show for their brothers and sisters since they were the two oldest. Chris and Matt have one brother and three sisters. Being teammates also has made life easier for Joe and Mary, who have just one college hockey team to follow instead of two. But with Baxter approximately a 12-hour drive from BG, the parents only see a handful of games each season. The Pohlkamps, like many WCHA parents, watch live streams of the games on the Internet. “Our parents love having us as teammates,” Matt said. 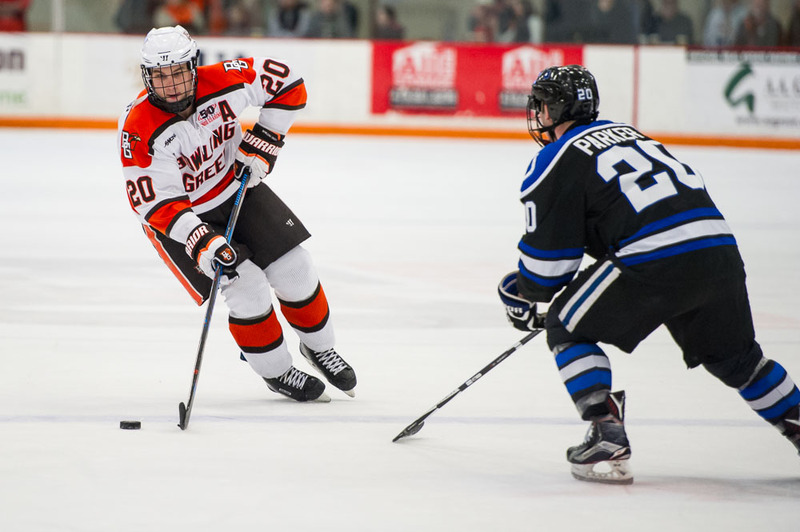 Bowling Green’s Matt Pohlkamp (left) against Alabama-Huntsville’s Brandon Parker during Friday’s game. Matt is a relentless forechecker, who is responsible offensively and defensively, and the 6-foot, 199-pounder is one of BG’s best penalty-killers. Chris (5-10, 193) is a solid defenseman who also provides a physical presence. Matt also skates on the power play and is an assistant captain, while the brothers both kill penalties. The Pohlkamps both came to BG, in part, because of Falcon assistant coach Ty Eigner, who was the head coach at Brainerd High School from 1999-2006. The brothers have been a steal, of sorts, from the Falcons since very few other schools showed an interest in either of them. Although Chris didn’t choose the Falcons solely because his brother already was at BG, it was a factor in his joining the team. “I had the inside scoop. I asked him everything, what’s the coach like, what’s the team like, what’s the school like,” Chris said of the recruiting process. Chris’ solid first season was helped by his ability to fit in quickly. He also became close with two of Matt’s roommates and classmates, forwards Kevin Dufour and Pierre-Luc Mercier. Matt Pohlkamp, Dufour and Mercier often have skated on the same line during their careers. The Pohlkamps both have been regulars since joining the BG program. Matt has 33 goals and 44 assists, and an on-ice rating of +32 in 131 games, including eight goals and four assists this season. Chris has a goal and 11 assists and is a +5 in 69 career games, including six assists this season.